A fully recovered Todd (“Infection”) steps through the Stargate into Atlantis, bringing news of a new Z.P.M.-powered Wraith hive ship. It must be stopped before it is fully matured, and virtually invincible. Todd reveals to Lt. Colonel John Sheppard and his team that he stole a number of Zero Point Modules from the Replicator home world when he participated in the coalition effort to destroy it more than a year ago (“Spoils of War”). Ever since, his scientists have worked to wed the Ancient power source to Wraith organic technology. Recently one of Todd’s underlings made the breakthrough — but instead of handing over the advancement, he used it to attack Todd. Suspicious and wary, expedition commander Richard Woolsey, Colonel Sheppard, and the team know they have no choice but to investigate. Aboard the Daedalus, ship commander Steven Caldwell grants Sheppard and his team consent to approach the super-hive in a cloaked Puddle Jumper. Rodney McKay’s analysis has barely begun when the Jumper is targeted by improved sensors capable of penetrating their cloak, and fired upon. The Jumper is damaged before the Daedalus joins the fight. The Earth ship’s powerful Asgard beam weapon inflicts only minor injury on the larger, denser hull of the super-hive. The Wraith launch a massive assault. The Daedalus loses shields, weapons and hyperdrive — but instead of finishing them off, the super-hive jumps away. McKay thinks the Wraith ship may have simply exhausted its energy capacity. Dr. Kavanagh, however, recorded a subspace signal that reached the super-hive just before it jumped. It’s a Wraith code laced with radiation. He doesn’t recognize the energy signature on the transmission, but McKay does: The signal crossed through a subspace rift from an alternate reality (“Vegas”), a phenomenon that Rodney has seen before (“McKay and Mrs. Miller,” “The Daedalus Variations”). The transmission contained the location of Earth. By the time the Daedalus returns to Atlantis, the Sun Tzu and the Apollo have engaged the super-hive in the vast distance between the Milky Way and Pegasus Galaxies. 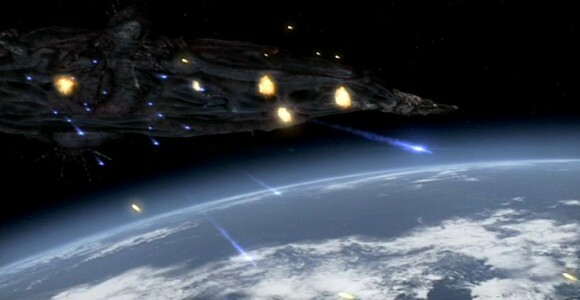 Both Earth vessels were heavily damaged, while the super-hive sustained no injury. The only good news is that no other Wraith hives detected the signal. McKay believes the super-hive would be the only one with sensors capable of detecting it. With the Odyssey away on a super-secret mission, the only ally Earth will have in the fight against the super-hive is Atlantis herself. Launching into space again will require a full complement of Z.P.M.s. Sheppard goads Todd into supplying them with a location, and Major Lorne’s team retrieves the power sources for the city. Woolsey sends Sheppard back to Earth via the Stargate to operationalize the Ancient weapons platform in Antarctica. Colonel O’Neill wants him in the chair when the Wraith arrive. Dr. Carson Beckett will man the Atlantis control chair, taking the ship off the planet’s surface and home to Earth. As the city prepares to leave the Pegasus Galaxy, Woolsey offers Teyla and Ronon the opportunity to remain behind — but they choose to stay and fight alongside their friends. At Stargate Command on Earth, Sheppard is greeted by Lt. Colonel Samantha Carter. Due to take command of the newly-commissioned ship named after General George Hammond (who recently passed away of a heart attack), she is in charge of the base while General Landry heads a task force in Washington. Major Paul Davis from Homeworld Security shares images of the super-hive, which is now parked in lunar orbit. Sheppard wants to dispatch F-302s fighters armed with nuclear warheads. The powerful hive ship is keeping its distance, since the Wraith signal from the other reality also warned it of the Ancient weapons platform — which was recently relocated to Area 51, in keeping with the Antarctica Non-Proliferation Treaty. To try and take it out, the Wraith launch an attack with a massive wave of Darts. Despite the best efforts of Sheppard and the F-302 pilots, some Darts make it through and destroy Area 51. The Ancient chair is also destroyed. Sheppard’s ship is damaged in the fight, and after recovering from a tailspin he heads for space, where he plans to shoot his way into the super-hive’s Dart bay and detonate his nuclear warhead inside the ship. When Atlantis drops out of hyperspace at the edge of the Milky Way Galaxy, Dr. Zelenka tries to dial the S.G.C. gate. But the Wraith have anticipated this, and brought a Stargate along with them from the Pegasus Galaxy. Because Pegasus gates have precedence, the wormhole connects to the gate on board the super-hive instead. Though they have no way of contacting Stargate Command, Woolsey sends Ronon, Teyla, McKay and Major Lorne through to try and sabotage the Wraith vessel. Zelenka tells Woolsey about McKay’s research into the breakthrough concept of wormhole drive. It works basically using the same principle as gate travel itself — creating an artificial wormhole for nearly instantaneous travel across vast distances. While unstable and requiring enormous power, it could have Atlantis in Earth orbit within seconds. Knowing that the super-hive is already at Earth, Woolsey gives the go-ahead for the risky plan. As Sheppard shoots his way into the Dart bay and parks his 302, the Atlantis team fights its way through the ship. Ronon fights off a group of Wraith warriors, saving McKay’s life — but is stabbed from behind, and dies on the corridor floor. Sheppard calls the S.G.C. to report arming the nuke, and Rodney’s headset picks up the communication. He tells John to stop what he is doing, and the team rendezvous with him. McKay rigs the nuke for remote detonation before they head for the Stargate. Along the way, they find that a Wraith has restored Ronon to life for questioning. They free him and head for the Stargate to escape. The Wraith power up their weapons to attack Earth, and the team is out of time. Carter orders Sheppard to detonate his nuke even though the Atlantis team is still aboard. But before they flip the switch, Atlantis appears between Earth and the super-hive. Beckett fires the drones, keeping the much larger and more powerful enemy vessel at bay long enough for Sheppard and the team to get to the Stargate. The super-hive weapons pummel Atlantis, reducing its shield strength. Drained of power, Atlantis risks destruction as it is pushed down into Earth’s atmosphere. Still, Beckett maintains the drone assault. Dialing the Alpha Site, Sheppard arms the nuke before the team escapes through the Stargate. The device detonates, and the super-hive is destroyed. Atlantis continues its forced descent, creating a massive fireball over the North Pacific. The Navy quickly cordons off an area near the Golden Gate Bridge as the cloaked city soft-lands on the ocean’s surface, just outside of San Francisco Bay. The team returns to the city, and everyone is safe. And after millions of years in the Pegasus Galaxy (“Rising”), the lost city of Atlantis has come home. Some five years after its discovery in a cavern under the ice of Antarctica (“Lost City, Part 2”) — the Atlantus outpost, left behind when Atlantis left Earth millions of years ago (“Rising”) — the Ancient control chair was relocated to Area 51 in New Mexico. Because it controls a cache of drone weapons, it was deemed to be in violation of the international non-proliferation treaty that covers the continent of Antarctica. At least the chair was moved to Area 51, and quite possibly the drone weapons and the rest of the control systems (generally referred to as the “Ancient weapons platform”). It has subsequently been destroyed by a Wraith Dart kamikaze attack. During its life the defense platform saved Earth from Anubis’s attack (“Lost City, Part 2”), and deterred other Goa’uld from making a run at Earth themselves (“New Order, Part 1”). As discussed in this episode, traditional Wraith attack strategy is to dial into a target planet’s Stargate, preventing it from being used as a means of escape. Because they were attacking Earth, a planet in another galaxy, however, the Wraith had to find an alternate plan. Instead they brought a Pegasus Galaxy Stargate along with them on the super-hive, preventing Atlantis from sending any reinforcements through the gate. The S.G.C., however, should still be able to dial out, since the presence of two operational Stargates in the same area don’t prevent out-going wormholes (“Watergate”). This seems to demonstrate conclusively that, when a Pegasus gate (blue chevrons) and a Milky Way gate (red chevrons) are on (or near) the same planet, the Pegasus gate will always take precedence for receiving an in-coming wormhole. When Atlantis dialed Earth’s gate address, they learned that the wormhole was connected to the Pegasus gate on the hive ship. This is likely because the Pegasus gates were created later (after the Ancients moved on from the Milky Way to the Pegasus Galaxy), and are a more advanced (or at least later, “2.0”) iteration of the technology. This is not only biologically interesting, but also fascinating from a sociological standpoint. The Wraith commander did not heal Ronon as a gift, but in order to interrogate him — the first time we’ve seen such an action on the part of the Wraith. Rodney McKay has been working on a technology found in Atlantis’s Ancient database, called a “wormhole drive.” It works on the same principle as the Stargate itself (which was also invented by the Ancients), creating an artificial wormhole to a destination far away — though without the use of gates on either end. The Ancients never got the wormhole drive to work, but it was apparently installed (or readily available) in the city-ship’s systems. With McKay’s work Dr. Zelenka is finally able to bring the drive online, and the dangerous trip takes the city from the outer edge of the Milky Way Galaxy to Earth orbit in mere moments. “Enemy At the Gate” is the 100th and final episode of Stargate Atlantis. It was announced in late August, 2008, that the show would not continue to a sixth season — due in part to soft ratings, a desire to make Atlantis movies while the brand was still strong enough to support them, and the producers’ readiness to launch Stargate Universe. The series finale was intended to be followed by an Atlantis movie on SCI FI Channel — the first in what produced hoped would be a series of Stargate Atlantis movies. Unfortunately, the decline in the DVD market and MGM’s looming bankruptcy shelved the project. A script for the movie, Stargate: Extinction, was written by executive producers Joseph Mallozzi and Paul Mullie. This episode marks the first Atlantis appearance for regular Stargate SG-1 guest star Colin Cunningham (“Major Davis”), who has appeared on SG-1 since its second season (“A Matter of Time”). “Speaking of titles — we finally got one for our 100th episode: ‘Enemy at the Gate.’ Looks like it will shoot in the #19 slot, meaning we’ll wrap in Vancouver and finish shooting Season Five in Las Vegas. “I thought they pulled out all the stops for the finale, not only with different beloved characters in the Atlantis gallery that pop up, but I think it’s a pretty spectacular one hour [with] three different storylines really hurtling toward the conclusion. … It’s going to have good action, great visuals, and it’s got a nice little emotional punch at the end. I think it was a very nice way to not only wrap up the series but to open the door to some television movies, because where we left off at the end it certainly begs the question of what’s next. I think it’s a very well-crafted finale. “But then the network wanted a scene with Keller earlier in the show (as it stands, she only shows up about three quarters of the way through and it’s a little jarring), so I cut that dialogue and added a whole separate scene at the top of Act One where Sheppard goes to Keller, who’s done an exam on Todd, and she tells him he’s back to feeding. But then it got cut for time. “A wormhole drive is just that — a drive that sends the ship through a wormhole, like a person stepping through an active gate. The advantage being that you don’t ‘travel’ through hyperspace for hours on end. You get de-molecularized, or whatever you want to call it, and then spit out at the other end a few seconds later. It’s basically instantaneous, which is why I needed it as a device in this episode. The final episode of Stargate Atlantis pays homage to actor Don S. Davis, who portrayed General George Hammond for seven years as a regular on SG-1 (and in many guest appearances thereafter). Don left the show due to increasing health problems, but made a recovery. His death of a massive heart attack in June, 2008, came as a shock to everyone who knew and loved him. Earth’s newest ship — originally to be called the Phoenix (“The Last Man”) — was instead christened the U.S.S. George Hammond. (Carter appears to call it “the General Hammond,” but later evidence — namely the ship’s plaque seen by fans on the set — shows its official name.) The ship made its first appearance in the premiere episode of Stargate Universe. “We knew we wanted the city to come down somewhere on Earth. We also knew we wanted some recognizable landmark to be visible once it was down (if they were just in the middle of the ocean, the view wouldn’t have been any different from the way it was in Pegasus for the last five years). In my mind, the city would have to come in at an angle over open water, then land — as softly as possible — within sight of a coast. VOTE! How would you rate Atlantis's "Enemy At the Gate?"